The first thing to say about the translations here is they are all my own work, unless otherwise noted. If I have credited someone else, please check with them before you use their text! Second, the translations I am offering here are literal rather than poetic; they are a ‘crib’ to help others explore the original verse. Maybe that requires a few words. For me, it is the charm and elegance of the original which I love. I have no illusions about my own poetic skills, which are too weak to provide a genuine translation, seeking to match those features of the original. I also have no illusions about my grasp of French: mine is schoolboy French supplemented with other reading, I am nowhere near a native speaker & I can’t guarantee accuracy in the translations! On the other hand, by transcribing the poet’s (literal) meaning (as far as I can…) I aim to help readers enjoy the French poems, not to replace them. After all, the Italians say “traduttore, traditore” (translator = betrayer) – and the French word for translation (traduction) also implies a form of betrayal…! I don’t really believe that to translate an author – even a poet – is to ‘traduce’ him, but obviously my prose, literal renditions ARE a betrayal. 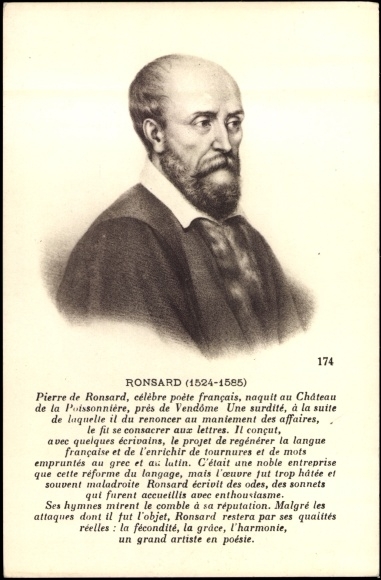 Even if I could find the right words to render Ronsard’s lightness of tone, the easy flow of his lines, or his depth of feeling, into English, the English versions would have none of the sonority, the rhythm, the bounce, the ebb and flow, and perhaps most importantly (in the sonnets at least) the formal structure which Ronsard’s poems do. And of course the way in which Ronsard expresses himself is influenced by the form in which he writes. For instance, the sonnet and its strictures: when in Sonnet 23 of Amours I, Ronsard compares his beloved to sapphires, jasper, porphyry, diamonds, rubies’, I have no doubt that some or all of these are chosen to fit metre and rhyme, as much as for their associations of precious-ness. Similarly in Odes 4, 18 the birds and flowers Ronsard names include a few surprises – hoopoes and cuckoos, thyme and anise, as well as the flowers “well-known from the blood of Ajax and Narcissus”. While there is no doubt Ronsard’s choices are appropriate, it is still likely that his choices are partly made for scansion. So while I carefully translate the terms he uses, in fact they are (probably) surface effect in his poem. A ‘proper’ translation – equally strictured by the form of the sonnet but in English – would perhaps push the translator towards other ‘surface effects’ which suited his English poem better? So why bother at all?! Well, accepting all these defects, I enjoy getting to grips with the poems in this way, and if, by indulging myself by putting the translations here, others can find something more in Ronsard’s poems and enjoy the way he expresses himself in his poems in French, then my aim is served. Which is also why I’ve put them side by side – the translations are not independent, they are just a ‘crib’ which might make it easier to access the original. How would you like to tackle another translation? We’re looking for Ronsard’s “Quand j’estoys libre ainsi l’amour cruelle”, which seems to have eleven stanzas in its musical setting by Adrian LeRoy.